Dolpo located in the far western region of Nepal, the land of Dolpo and its fabled Crystal mountain were the focus of Peter Matthiessen’s classic book ‘The snow Leopard’. In 1988, the southern valleys leading to Dolpo’s Shey-Phoksundo National park were de-restricted. The visit to Shey Gompa and the rest of the huge park covering 1,373 sq. km above Phoksundo Lake is still restricted and special trek permit is required from Kathmandu to enter the region. The trekking into this remote and agriculturally impoverished landscape requires a mindset to endure hardships and all foods and camping equipment to be carried from Kathmandu. 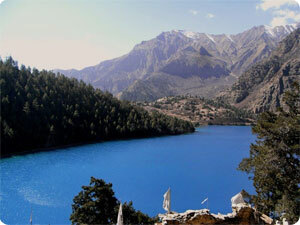 There are several approach routes to Dolpo from Pokhara, and Jumla. As it is in the isolated part of Nepal, there the nature seems to have remained exactly the same as it was first created- unharmed and unaltered. Undisturbed and preserved for centuries now. Blue sheep, leopards and other interesting Himalayan animals are still there in that region. To trek on Dolpo region is quite an experience of life. Grade: Moderate to Strenuous and alpine. Culture: Mixed with typical Nepalese ,Tibetans. Splendid breathtaking place: Most challenging special trek in remote western Nepal . Day 01:	Arrival in kathmandu 1334m, Himalaya Journey Treks & Expedition’s representative will transfer to hotel , Dolpo trekking briefing with officially arrangements. overnight at Kathmandu. Day 02: After breakfast, our tour guide will take to you for historical monuments sightseeing around kathmandu valley such as Bhkatapur, pasupatinath, Boudhhanath, kathmandu durbar square & Swaymbhunath(monkey temple) and prepare for the Upper Dolpa trekking because this day is required to make Dolpa special trekking permit with original passport. Overnight at kathmandu .